Victims of electrical shock have been around as long as experiments in electricity and electrical appliances have been around. For that matter, even ancient men unfortunate enough to have come into contact with an electric eel or a lightning bolt, or even those who rubbed against sheep's wool in an arid environment and then reached for a metal implement, know the pain of an electrical shock... or worse. This article in the August 1959 edition of Popular Electronics warns readers of the dangers lurking at the end of every electrical cord. 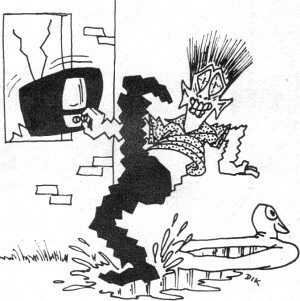 One of the cartoons shows a guy being zapped while using an electric drill. About a year after graduating from high school, a friend of mine was using a power saw in a garage that had a damp, dirt floor. Even as late as the mid 1970s there were still a lot of power tools that had metal bodies, and usually had no ground wire. 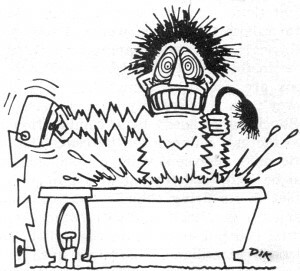 Electrocutions were not uncommon. My friend died from his contact with 120 VAC. Today's power tools are always listed as "double insulated" by the Underwriters Laboratory. They provide at least two layers of protection that shield the user from contacting live components. The National Electric Code stipulates that only tools with the official double insulation mark (a squared inside another square) may be used without a safety ground connection. Even a double insulated tool cannot guarantee your safety when being operated on a damp dirt floor if there is low enough resistance to the inside of the tool via mud or water; only a ground fault interrupter circuit (GFIC) can do that. By Forrest H. Frantz, Sr. Most of us have been "bit" at one time or another. If the shock was a mild one, we said "ouch" or "d--n" and that was that. We gave it no further thought. However, we should think about it. An appliance that in one situation may produce a slight tickle, in another may jolt us right into a hospital bed or worse. Each year electrical shock takes approximately 800 lives in this country, and these 800 executions are usually accomplished with less power than it takes to press a shirt! Shocks are caused by a combination of two factors: voltage and current. The relationship between voltage and current can be compared to that of a gun with a bullet in its firing chamber, with voltage being the gun itself, and with current - the actual death-dealer-being the bullet. The current, or bullet, is harmless until it is "fired" by the voltage. Thus neither voltage nor current is dangerous until they exist in the proper relationship. 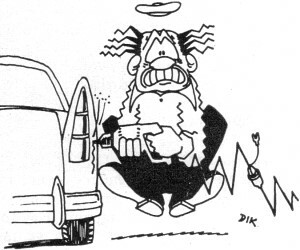 This explains why a 50-volt jolt occasionally will cause death, while an automobile's ignition system - with its several thousand volts of shocking power - is rarely a killer. The amount of current in a "shock" circuit is determined by the applied voltage in relation to the sum of the internal resistance of the power supply, the resistance of the body, and contact resistance at the points where the circuit is completed. Don't adjust your radio while taking a bath. This is an easy way to start a one-way trip to Paradise. Always ground the third wire from a 3-wire portable electric tool. If the motor shorts out to the frame, the grounded wire will protect you from shock. Never touch electrical equipment while you are standing on a damp surface. If you do, you have a good chance of getting 117 volts through your body. Watch That Current! The amount of current that flows depends on the amplitude and source of the voltage, the physical size of the individual who is shocked, the portion of his body through which the current flows, and the condition of the skin at the points of contact. The amount of shock current can be calculated by (I = E/R). Assuming a voltage of 80 volts and an internal body resistance of 400 ohms, a fatal current of 200 milliamperes would flow. Fortunately, in addition to the internal body resistance, there is contact resistance between the voltage source and the skin. Dry skin contact resistance is between 100,000 and 600,000 ohms, but this figure decreases rapidly as the contact area increases and the skin becomes damper. A small amount of perspiration can lower skin contact resistance to 50,000 ohms or less, while complete wetting of the skin and increased contact area can reduce the contact resistance to between 500 and 1000 ohms. Wet-body contact might involve a total resistance of about 1000 ohms from the right to the left side of the body. With a voltage source of only 50 volts, the current would be 50 ma., a deadly level. After initial contact has been made, contact resistance decreases. If the decrease in contact resistance lowers the total resistance to 500 ohms, the current will rise to 100 ma. - enough to cause ventricular fibrillation, a heart condition that results in death. Current-Limiting Factors. But what about the cases where several hundred volts from a Geiger counter battery or thousands of volts from an automobile spark coil or a laboratory high-voltage machine do not cause death? In calculating the effect of a 50-volt shock, it was assumed that no internal resistance existed within the voltage source and that current was limited only by body resistance. This is not always the case. Any electric battery or electric generator has an internal resistance. If this internal resistance is low in comparison to body resistance, total body resistance will determine the amount of current flow. On the other hand, if the internal resistance of a battery or generator is almost as great or greater than body resistance, current flow is partially limited. 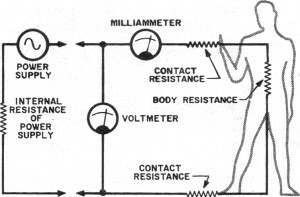 If the internal resistance of the voltage source is many times the body and contact resistance, current flow is limited to an almost constant value. Thus, in a 1000-volt generator with an internal resistance of 100,000 ohms, the current could never exceed 10 ma. Electrostatic generators such as Wimshurst machines or small van de Graaff generators can develop hundreds of thousands of volts. But, although these machines produce high voltages, their power output (volts x amperes) is small. When contact is made with a "hot" van de Graaff generator, the current flow is limited to a low value, as it is with automobile ignition systems. However, live experiments should be avoided because there are exceptions! Effects of A.C. Shocks. Special physiological effects of electrical shocks are determined by the frequency of the voltage. While both d.c. and a.c. can cause burns, low-frequency alternating current - and this includes the standard 60-cycle house current - affects the nervous system. At current values between 8 and 15 ma., a.c. shocks are painful, but most individuals retain enough control of their muscles to withdraw from contact. Currents between 15 and 20 ma. cause pain and loss of muscular control. The victim cannot voluntarily withdraw from contact. Unless the current is interrupted, the victim becomes exhausted and lapses into unconsciousness. When a.c. shock currents reach values between 20 and 50 ma., pain is very intense and paralysis of the breathing muscles will cause suffocation. When a 60-cps alternating current of between 100 and 200 ma. is applied to the body, the frequency superimposed over the heart's normal beat can disrupt its timing. Since the heart is being told to pump at a rate of 72 times a minute by the nervous system, and, at the same time, it receives external stimuli from the house power supply at the rate of 60 per second, it becomes confused and begins to flutter aimlessly. This is ventricular fibrillation. Currents greater than 200 ma. stop the heart's movements completely, rather than causing ventricular fibrillation. If exposure to the shock is not prolonged more than three or four minutes, however, the heart will sometimes resume its action. Shocking Situations. The knowledge that it takes two contacts to cause a shock tempts some people to take foolish chances. Don't work on your house wiring until the power switch is turned off. Although you may have one of the wires completely taped up, if you happen to be working with the "hot" wire and then you back into a cold water pipe, zowie! If you're standing on damp ground or on a concrete floor, you can get a shock right through your shoes. A number of people have been killed each year because they touched light fixtures, switches, or radios while standing in a bathtub. If you're taking a bath and you want to change the radio station, don't - it's such an undignified way to leave this world. Switches are normally insulated from the a.c. line; but a defect in wiring, or an insulation breakdown, can cause a fatal accident. If these things seem unlikely, keep in mind the 800 Americans who die each year from "unlikely" shocks. Portable electric tools are a "sneak-path" threat. To minimize the chances of sneak-path electrocution, most portable tool manufacturers provide a grounding wire connected to the frame of the tool. If the insulation breaks down or a short from the motor to the frame occurs, current will return to ground through the grounding wire (if it's grounded, of course) instead of through the user. The short will usually necessitate the replacement of a blown fuse. This is small trouble, however, compared to what might happen otherwise. The a.c./d.c. radio and other a.c./d.c.-operated electrical devices are additional sources of danger. In the earlier a.c./d.c. devices, one side of the line was connected directly to the chassis. If the line cord for one of these units is inserted so that the chassis is connected to the hot side of the line, body contact from chassis to ground (even though the equipment is not turned on) can result in electrocution. At present, most a.c./d.c. equipment is manufactured with the chassis connected to one side of the line through a capacitor. But even this measure does not completely eliminate the shock hazard. At 60 cycles, a 0.5-μf. capacitor has a reactance of 5300 ohms, and a 0.1-μf. capacitor has a reactance of about 26,500 ohms. If the body is placed in series with a 0.5-μf. capacitor across the line, electrocution can occur. Although electrocution is unlikely from body contact to the a.c. line through a 0.1-μf. capacitor, a shock will occur. The experimenter should proceed with caution when working with a.c./d.c. equipment. If possible, isolate the equipment from the line with an isolation transformer. Emergency Procedures. In any shock emergency, the circuit should be broken as quickly as possible, preferably with a switch. If you can't get to a switch, remove the victim from the circuit. But take precautions to avoid becoming a second victim. Remember, the victim is "hot," and if you simultaneously touch him and a good ground, you won't be in a position to help anyone. If the victim is not able to breathe after he is removed from the circuit, don't waste time calling a doctor. Apply artificial respiration immediately and keep it up until someone else brings a doctor. 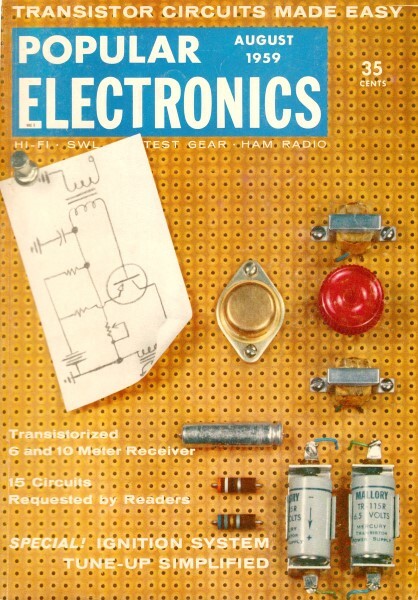 With the observation of basic safety rules, electronics is not a dangerous hobby. But a complete knowledge of the "enemy" and his "tactics" is your best insurance against painful and possibly serious accidents. Don't take chances with house wiring, don't touch any electrical fixture when your hands or feet are wet, and don't work with a.c./d.c. equipment unless you are aware of its shock hazard.